We’d love your help. Let us know what’s wrong with this preview of A Nice Derangement of Epitaphs by Ellis Peters. "Shed here no tears. No Saint could die More Blessed and Comforted than I." So read the epitaph composed by Morwenna Treverra centuries ago as she followed her beloved husband, Jan, into death. The couple have been together ever since, models of pious content, in the little seaside Saxon church near the villa of Maymouth. When curious scholars arrange to open Jan Treverra's "Shed here no tears. No Saint could die More Blessed and Comforted than I." So read the epitaph composed by Morwenna Treverra centuries ago as she followed her beloved husband, Jan, into death. The couple have been together ever since, models of pious content, in the little seaside Saxon church near the villa of Maymouth. When curious scholars arrange to open Jan Treverra's tomb, it yields not one body but two...and neither one of them is Jan Treverra. To ask other readers questions about A Nice Derangement of Epitaphs, please sign up. I do so love Ellis Peters. I know she sold a gazillion Brother Cadfael books and so one really can't pity her, but I still think she is under appreciated. Her contemporary mysteries are so good. The writing is clean and lovely and sad. Every book is a meditation on mortality. They're about the awareness of moments, either miniature celebrations of life or tiny one act tragedies that maybe just play out on a person's face. And maybe give away a murderer. And then there's this fullness and contente I do so love Ellis Peters. I know she sold a gazillion Brother Cadfael books and so one really can't pity her, but I still think she is under appreciated. Her contemporary mysteries are so good. The writing is clean and lovely and sad. Every book is a meditation on mortality. They're about the awareness of moments, either miniature celebrations of life or tiny one act tragedies that maybe just play out on a person's face. And maybe give away a murderer. And then there's this fullness and contentedness that comes with recognition. The characters recognize what they know, what they're experiencing -- love or maturity or connectedness or disappointment or transition. Maybe it's not realistic to write characters who are so aware of their place in life, but it is very joyful. And then there's a gentle underlying grief because mortality includes all those moments and the fact that they are finite. Peters sends her sleuthing family the Felses into Cornwall on vacation and right into the thick of an interesting group of characters and their problems. You may recall that after Felse #2, I was concerned about the Felse Family Investigations becoming formulaic. Felse #3 broke that mold and #4 has smashed it to smitherines. Not only is the setting new, but the characters, new friends all, and also this tale is structured tightly to a long weekend timeline of Wednesday through Monday. Peters abi Peters sends her sleuthing family the Felses into Cornwall on vacation and right into the thick of an interesting group of characters and their problems. You may recall that after Felse #2, I was concerned about the Felse Family Investigations becoming formulaic. Felse #3 broke that mold and #4 has smashed it to smitherines. Not only is the setting new, but the characters, new friends all, and also this tale is structured tightly to a long weekend timeline of Wednesday through Monday. Peters ability to write substance into every scene, string us along with copious information along with clues, all the while withholding the solution to the puzzle, is admirable. Peters own character also comes through as she deals in this edition as others with passion and crime in a manner appropriate for all ages. This threw shadow on my last journey to Cornwall in the words of Rosamunde Pilcher’s The Shell Seekers, which I completed prior to this Felse binge. The Shell Seekers ended with a conviction that while it was memorable, it wasn’t a title I wanted hanging around my house for future reading. In direct contrast, I find myself promoting Peters Felse Family Investigations inside and outside our home. The Cornish setting allows this book to feature peculiarities of a seatown, including its coastline, culture of seamen/ tourists passing through, and local legends. Inspector George Felse is the leading character, as he consults on a case out of his jurisdiction, but Peters main concentration of family development in this work centers around the Rossall family of Tim, Philippa and Patrick. The discovery of this series has become a welcome triumph of this span of illness I’m facing. As I still have to hold back on physical activity to promote healing, I’ve already downloaded #5! Read this the night I had to stay up all night in the San Francisco airport. She's a good writer with a good storyline and good characters. It's a comfortable mystery. My first of this mystery series and I call it "OK." Not as good as the "Peter Wimsey"or the touchstones of the genre, but has its moments. The best element is the puzzle, with twists. The weaker spots were the atmosphere, clear relationships between characters, and a blandness of Felse (in this novel at least). The character Simon is the most interesting and varied in personality, from sweet to angry, tempermental. Simon also provides much of the solution to the puzzle. I give it 3 stars based My first of this mystery series and I call it "OK." Not as good as the "Peter Wimsey"or the touchstones of the genre, but has its moments. The best element is the puzzle, with twists. The weaker spots were the atmosphere, clear relationships between characters, and a blandness of Felse (in this novel at least). The character Simon is the most interesting and varied in personality, from sweet to angry, tempermental. Simon also provides much of the solution to the puzzle. Edith Pargeter, the real name of Ellis Peters, was a mystery-writing genius of the first order. Very few are the authors who can create a whodunit that a reader might want to re-visit so often and with such pleasure. Come for another adventure of the Felse family, stay for the boldly drawn character development of the coast of Cornwall cast, and hang on for I love this book. I think I like each Felse mystery more than the last. We see Dom grow, but his involvement with the mysteries ebbs and flows. The stories themselves are really engaging and I always want to know who dunnit. Motives tend to be fairly straightforward, but this isn't a bad thing. The next book was smapled at the end of this one, and once I get through my current pile, I will probably go on to this one! Few authors can tell a story or turn a phrase as well as Ms. Peters. Even the descriptive phrases, which might seem trite or overdone with other authors are a joy to read. The characters are strong, the plot well done. Also published as A Nice Derangement of Epitaphs, Inspector Felse #4. Vacation trip to Cornwall; the Felses are roped into the investigation of several murders. A cave enlarged by smugglers blocked off by the tide, grave robbing, hiding murdered bodies in tombs. Wat lezend de boeken van Ellis Peters toch altijd heerlijk. Ik kan enorm genieten van haar verfijnde manier van omschrijven. 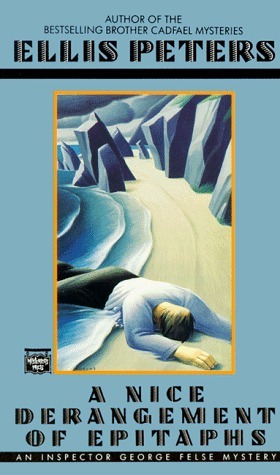 The Felses, on holiday in Cornwall, encounter a suspicious death. Classic mystery story. I’ve put this book aside for the time being to catch up on other reading. A very complete complex wonderful book! The best thing about this book is the loving, human relationships. "You can be demonstrative with mothers, but showing fathers how you feel about them is not quite so simple. You use what offers, and hope they'll get the idea." Not the worst fate that could've befallen a reader, but no doubt a regretful one. I came across some of Ellis Peters' non-Brother Cadfael murder mysteries at an op shop in 2013, none of which I'd read or seen before. Decided to start with A Nice Derangement of Epitaphs. It's an Inspector Felse mystery, though since he's on holiday with his family in this one his detective work is minimal. The plot is neat enough, with a few surprises, though I thought I'd figured out the villain early on, and for once was right. Except that things weren't quite as they seemed, and Peters had I came across some of Ellis Peters' non-Brother Cadfael murder mysteries at an op shop in 2013, none of which I'd read or seen before. Decided to start with A Nice Derangement of Epitaphs. It's an Inspector Felse mystery, though since he's on holiday with his family in this one his detective work is minimal. The plot is neat enough, with a few surprises, though I thought I'd figured out the villain early on, and for once was right. Except that things weren't quite as they seemed, and Peters had one or two twists up her sleeve before the end. I have been enjoying the Inspector Felse series by Ellis Peters. I was not able to find Book 3 in audiobook, so I've moved on to this Book 4. The writing just gets better with descriptions that really let you visualize the place and activities. In this case Inspector Felse and his family are at a seaside town, and there are cliffs and rip tides and smugglers caves to envelop the big mystery of unexpected bodies in burial vaults. There are side mysteries, too, without a one of them being a red he I have been enjoying the Inspector Felse series by Ellis Peters. I was not able to find Book 3 in audiobook, so I've moved on to this Book 4. The writing just gets better with descriptions that really let you visualize the place and activities. In this case Inspector Felse and his family are at a seaside town, and there are cliffs and rip tides and smugglers caves to envelop the big mystery of unexpected bodies in burial vaults. There are side mysteries, too, without a one of them being a red herring. Once again, Dominic Felse is more the investigator than his inspector father, as it was in Books 1 and 2. In this book he is 18. Lettura collettiva di Marzo, consigliato da Blackcat. Ellis Peters è una giallista inglese, scomparsa nel 1995, famosa per i suoi "gialli" medievali di Fratello Cadfael. In questo romanzo il protagonista è l'ispettore Felse alle prese con una tomba violata e un segreto vecchio di due secoli. La struttura è da giallo classico alla Christie, l'ambientazione è la campagna inglese col suo micromondo, forse ormai scomparso, ma godibilissimo nella lettura. Il caso di cui si occupa Felse non è forse tra i più interessanti tra quelli narrati dalla Peters e da ciò dipendono, in parte, le due stelline. Un'opera che va bene per gli amanti del genere, che ne potranno apprezzare le atmosfere, non indicata, invece, per chi conosce poco il giallo classico inglese, poiché non ne potrà gustare le sfumature. Another awesome Ellis Peters. In a resort town, a famous writer is spearheading the opening of a several-hundred-year-old tomb in a church that gets buried by sand every few years. Inspector George Felse and his wife and son get in on the act when son Dom braves a dangerous ocean to help out a boy he thinks is drowning. There are smugglers' tunnels and a missing body. For these reasons alone, I would have read this book. However, Pargeter's plots just clip along and the characters and their compl Another awesome Ellis Peters. In a resort town, a famous writer is spearheading the opening of a several-hundred-year-old tomb in a church that gets buried by sand every few years. Inspector George Felse and his wife and son get in on the act when son Dom braves a dangerous ocean to help out a boy he thinks is drowning. The title's the best thing about this book. There is a teenage character in Lake Wobegon whose favorite books are about the LaFlamme (I think) family, whose teenage son is treated just like an adult. Wobegon guy longs for that life. The beginning of this book was like the LaFlamme series. I kept thinking this might be a Young Adult novel, but the rest of the book (and title) don't fit a YA selection. I think it's just a cloyingly written book. I have enjoyed Ellis Peters' Caedfal series, though. One of the George Felse mysteries. It took me forever to read it–I finally sat down last night and whipped through it because it was due today and it was my last chance. So, not my favorite. It wasn’t set in Shropshire, which is always half the beauty of the Felse books, and somehow it never quite pulled me in. This started off rocky, but got better as the story progressed. Character intrigues abounded and some were transparent while others provided a decent shock at the reveal. Unfortunately, the beginning ruined it and the climax to end did not provide enough recovery to truly make this book something I would recommend for others to read. This was the first Inspector Felse mystery I read, and maybe it wasn't the right place to start; I had a hard time getting to know the main characters. There were a couple of memorable secondary characters in the Inspector's extended family, though, and the puzzle itself was fairly audacious. If I didn't know better, I would have thought Ellis Peters was a 15 year old boy at one point in her life. In her character Paddy, she captures vividly all the angst and indecision coupled with the egocentric nature of a hormonal, young man. Great read!